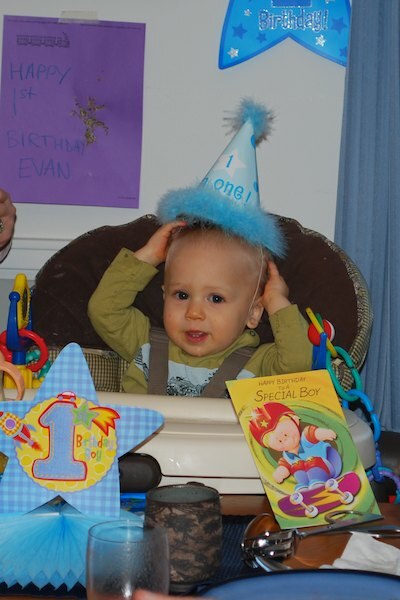 Last week, on January 18, 2012, we celebrated Evan's first birthday. It is hard for us to believe that a whole year has already gone by since he was born. We looked at pictures and videos of little Evan from his first week of life, and smiled remembering the little, wrinkly baby from January 2011. We remembered how he was born with his little ears folded over (they have found their way to a more regular shape now), and we laughed when we saw the video of Seth meeting Evan for the first time. Through all the kisses and hugs from Seth, Evan just slept and slept, cozy and comfy. In retrospect, we had an amazingly easy transition from a family of three to a family of four, helped greatly by a mellow little baby, an easy-going, loving, brother and a very helpful extended family! Last weekend, we had a small family party for Evan, which was perfect. Seth had decided a while ago that Evan should have a train party, so we had gotten train invitations. Due to a fever illness over the past couple weeks for both boys, we didn't have a lot of time to shop/prep for the party, but I printed out some outline pictures of trains, and Seth had a blast helping me color and cut out the decorations. Seth was very creative - he wanted to attach all the train cars on the wall into one long train, and glue some other train pictures onto popsicle sticks. He is really learning lots of things at Tiger School. The decorations came out great, and I had some of Seth's first birthday decorations, too. Jason prepared a yummy brunch, and we got an ice cream cake for Evan. I remember all too well how Seth did not like the sweet frosting on the store-bought cake I got him for his first birthday, so I was determined not to make the same mistake with Evan. Since he loves yogurt so much, I thought it wouldn't be too much of a stretch for him to enjoy the vanilla ice cream, and I was right. He loved it, and even enjoyed some of the frosting, too. He got some very nice gifts, including some Thomas the Train bathtub squirters that Seth picked out just for him (of course, Seth loves helping Evan use these in the bath). A one-year-old doesn't know what it means to have a birthday, but Evan did understand that he was getting some extra attention! He is so sweet and cute, and every time we said "Happy Birthday" we would say "yay" and clap, so that by the time his actual birthday rolled around on Wednesday, we just had to say "Happy Birthday," and he would clap! They were very impressed by this at daycare, and many people said Happy Birthday just to see his trick. We were so happy to have a low-key celebration with family, and to hear from many family and friends throughout the week. Evan loved the attention at daycare, and it was nice that Geema was at our house the morning of Evan's' birthday - we greeted him in his crib by singing "Happy Birthday!" He eyed us suspiciously so early in the morning, but I think he appreciated it! Our little monkey is such a spit-fire at one year old. We owe you some blog updates on milestones for both boys (coming soon), but suffice it to say that Evan is so full of energy and excitement it is a joy to see. He is speaking and signing his first words, he is cruising, standing for a couple seconds, and days from walking, and he is so interested in everything around him. Happy Birthday, Evan Kainoa Healy! We love you more than we can say, and you make our lives so happy!